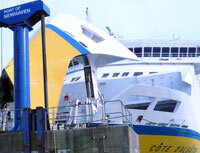 LCT Support Services is very pleased to take over the ferry port of Newhaven on behalf of Transmanche Ferries. This is the second major port agent contract won by LCT and presents significant challenges to LCT. As well as providing check-in and marshalling services to Transmanche Ferries, LCT will also provide stevedoring, security and all unaccompanied trailer services for the port of Newhaven. with train links to London and Paris. The town saw the arrival of the rich and famous who started travelling between London and Paris. For more information please visit Newhaven Ferry Port.